CARLSBAD, Calif. (KGTV) - A North County family is out of thousands of dollars after they said they were victimized in a bank scam. Krystal, who did not want to share her last name, lives in Carlsbad with her husband and their dog, Otis. Her husband is in the Marines and was recently in dive school in Florida. During that time, he received a call from what they thought was a USAA representative. USAA is a financial institution that serves primarily military families. “They sent him a code via text and had him repeat it,” Krystal said. “You could tell it was from USAA because there’s previous text messages from USAA from other times they sent us the code,” Krystal said. Krystal told Team 10 the caller said they needed to give her husband a new PIN number and asked for the current one. In hindsight, it was a red flag, but at the time, he was busy evacuating from Hurricane Michael. The call sounded legitimate, even using the same song USAA uses when her husband was put on hold. “[I was] very angry, very heartbroken; panicking,” Krystal said. “A phone today is just a computer endpoint on a network and as such, its identity can be spoofed,” Cobb said. Krystal said she found her debit car was used in multiple transactions on the East Coast. The scammer has not been found. She was finally able to get a refund but has since switched banks. Now, if she gets a call from a financial institution, she asks for a call back number to make sure it is real. 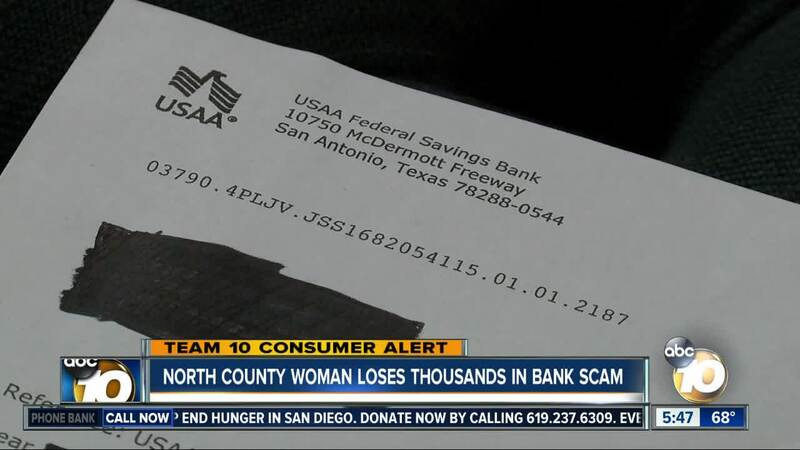 On its website, USAA said this cybercriminal activity is on the rise. It reminds customers that it will never ask for any personal logon information.